Restored and wired to work. The yellow version is also known as mustard- or topaz-coloured. These phones will work in virtually every country, and in many cases - if you let us know beforehand - we can make sure the telephone is delivered with the correct plug for your telephone network. All telephones have a 12 month guarantee. We also offer a full repair service. Click here for a ring sample. 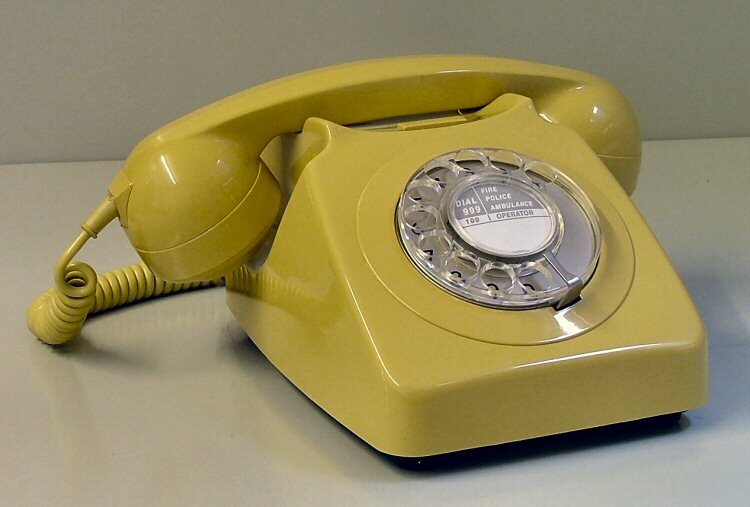 Introduced in 1959, the initial 700 type telephone used the 300 Type body with a new handset and transmission circuit. However, this was a stopgap until a new plastic body could be developed. The design for the new 706 body probably looked to the American Bell 500 telephone for inspiration. The use of plastic meant that a greater range of colours could be used. Another innovation was the now universal curly cord. 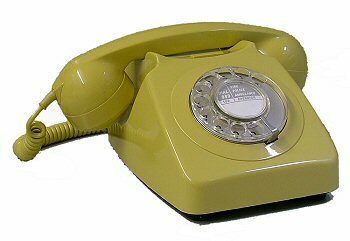 In the 1970s, the 700 Type telephone was given a minor facelift. The bodyshape was slightly modified as was the method of fixing the case to the body. Later on, the cradle rest was further modified to ensure that the handset sat firmly on the hook-switch. Here we present our range of original telephones, which have been restored to full working order - the bodies have also been polished, bringing the telephone almost back to its new condition.